Janice Lyle, the Director of Sunnylands Center & Gardens, has been at the estate since 2008. Michael S. Smith is an American interior designer responsible for the 2010 makeover of the Oval Office and the private quarters of the Obamas. Mark Davidson photographs for the Smithsonian, Getty Museum, and Hammer Museum. "Imagine what treasures await in this history of [Walter Annenberg's] fabled midcentury modern house in Rancho Mirage, California, which is now restored and open to the public. Completed in 1966 by the architect A. Quincy Jones, with rare preserved interiors by William Haines, the 32,000-square-foot Sunnylands attracted presidents, royalty and Hollywood moguls to its glassy rooms with pale clusters of low furniture." "Sunnylands: America's Midcentury Masterpiece brings back to cocktail-fueled life the pink-roofed winter estate of Walter and Lee Annenberg. . . . At this Palm Springs oasis, U.S. presidents and the queen of England lounged on buttercream sofas and admired Impressionist paintings on walls the color of after dinner mints." "The book's pages include original plans for the home, snapshots of its midcentury furnishings and impressive art collection, and scrapbook-like photos of well-known faces kicking back and having fun. . . . An ode to many things, every page of this book will draw a wistful smile." 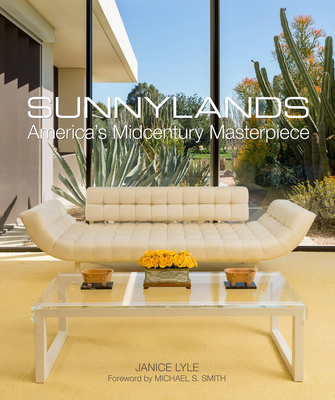 "Janice Lyle's new book looks at the history, architecture and over-the-top interiors of Sunnylands, the dazzling desert residence of philanthropists Walter and Leonor Annenberg designed by architect A. Quincy Jones and interior designer William Haines."